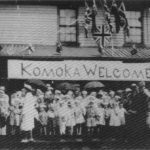 To provide suitable facilities for display, restoration, storage and cataloguing of artifacts, records and other items relating to the history, exploration, settlement, development and culture of … Komoka and area; in particular the influence of the railroads. 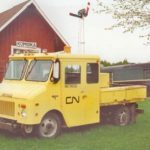 To move and restore the nineteenth century Canadian National Railway station to the Komoka Park, to provide the above. 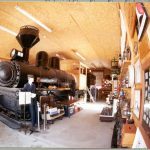 To … acquire any real or personal property or any rights or privileges which the Corporation may deem necessary in operating the Komoka Railway Museum. 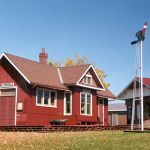 A portion of the museum is housed in the former Canadian National Railway station in Komoka, Ontario. When purchased as a museum in 1978, the building was moved to its present site north of the CNR tracks and adjacent to the Komoka Community Centre. 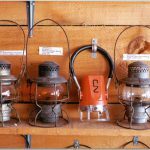 Many railroad items are available for close examination including telegraph keys, spike hammers, spike pullers, switch lanterns, steam gauges, a railroad safe, a baggage sleigh and a three-wheel velocipede. 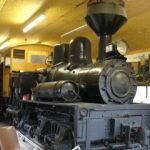 The Museum’s pride is a 1913 Shay steam locomotive, which is now nearly completely restored. It rests in its own building along with other artifacts. 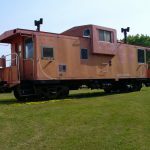 When restored, a pre-1939 steel-sided baggage car will house the gift shop, office and a model railroad display. A tiny 8 ft by 9 ft (2.4 m x 2.7m) Longwoods flagstop station is also onsite. Serious researchers are most welcome to browse through the Museum’s extensive library of books, photos, and newspaper clippings (of which some are published on-line, see below).